In medium saucepan, melt butter over medium heat. Add dried plums, sugar, brandy and cinnamon; simmer 2 to 3 minutes or until dried plums are soft and compote is thickened, stirring occasionally. Stir in bananas; cook and stir 2 to 3 minutes or until bananas are heated through. Divide ice cream equally among 4 bowls. 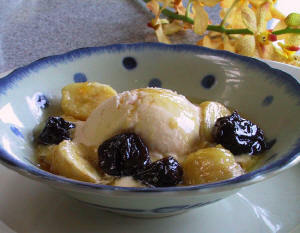 Serve compote warm over ice cream. Garnish with walnuts, if desired.